TSPSC TRT Notification 2017: Management authority of Telangana State Public Service Commission has depicted an employment notification concerning TSPSC TRT Notification. 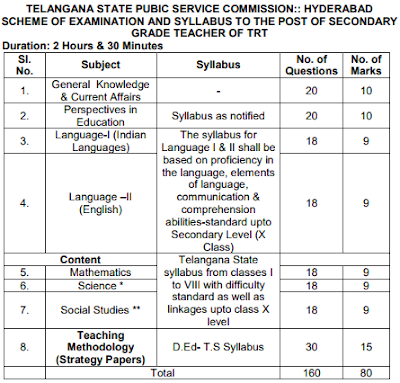 Interested and willing job entrants, who meet the required TSPSC TRT Eligibility Criteria, can apply against 8792 School Assistant, Physical Education Teacher (PET), Language Pandit and Secondary Grade Teacher in different districts as given below. To apply for TSPSC TRT Recruitment Notification, all the eager candidates need to fill and submit TSPSC TRT Application Form through online mode. Applying job seekers for TSPSC TRT Notification/ TSPSC TRT PET Notification are advised to submit online application form before the last date that is 30-11-2017. Job seekers who have passed in SSC, Intermediate and should possess Degree of Graduation, Post- Graduation according to the posts from recognized University/ Institutions with good academic records are eligible to apply for TSPSC TRT Language Pandit Notification, TSPSC TRT School Assistant Notification and others. Appliers for Telangana State Public Service Commission Teacher Recruitment Test must have relevant years of experience in related field if necessary. Age of candidates applying for TSPSC TRT Jobs/ Telangana State Public Service Commission Recruitment must not be less than 18 years and should not be more than 44 years. Upper age can be relaxed of those candidates belonging to reserved category as per the rules and regulations of organization. Minimum Age (18 years): Applier should not be born after 01-07-1999. All the candidates must pay Rs. 200/ towards Online Application Processing Fee, to apply for stated positions. Along with it, the applicants have to pay Rs. 80/- towards Examination Fee. However, reserved categories of candidates, Unemployed applicants are exempted from payment of Examination fee. All the shortlisted candidates on the basis of applications will have to undergo written test, Interview as per norms taken by the expert team of this reputed organization. How to Apply for TSPSC TRT Notification? Applicants should go through official site that is www.tspsc.gov.in to apply for TSPSC TRT Notification 2017. Now follow and press on “website” link to apply for Latest Government Jobs in India. Then from home page hit on “TRT Recruitment” link. A new page will be opened with various TRT Recruitment Notification link s as given below you need to press on suitable link. Notification No. 52/2017 DT. 21/10/2017 Teacher Recruitment Test In School Education Department School Assistant. 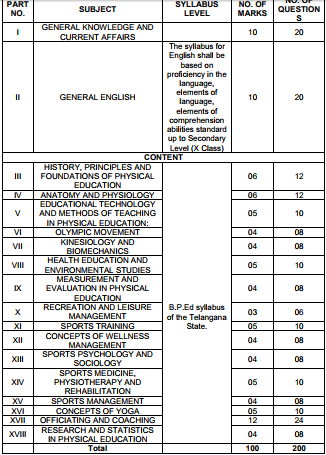 Read TSPSC TRT Notification very carefully with complete details. After reading entire details given in Telangana PSC Recruitment Notification, Go back to home page follow ‘One Time Registration’ and choose link as given below. If you are new user then press on “New” and if you are existing user then press on “Edit” link. Now fill your TSPSC TRT Online Application Form with correct details in accurate manner. Upload relevant document/ testimonials according to requirement. Hit on “Submit button” it will automatically submit within few seconds. Finally don’t forget to retain a print out of TSPSC Online Application Form for further use. 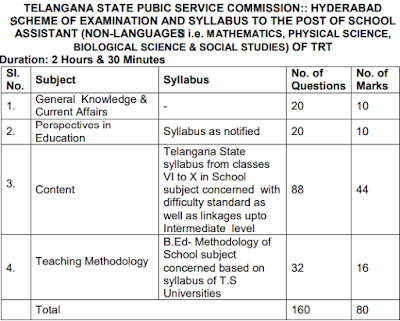 Candidates may get other details about TSPSC TRT Notification through this Official Link.